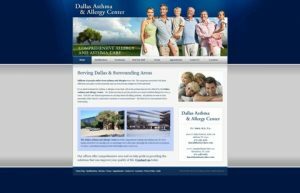 The Dallas Asthma and Allergy Center came to us looking to have a website built showcasing their 2 Clinics. The client was not interested in the ability to manage, update or add to the website, so we developed the website in straight PHP, without any sort Content Management System to weigh the website down and insure lightening fast page load speeds. Why is page load speed important? The obvious answer is that website visitors don’t like to be kept waiting for sites to load. There is another reason that’s just as important though: Page load time is one of the factors that weighs in to Google ranking and search placement. Websites that load quickly are given an advantage over slower sites. There has been an increasing importance laid on the website loading time when it comes to user experience and its potential effect on a site’s Google search engine ranking. This is because Google is becoming serious in the campaign to load websites faster. The Dallas Asthma and Allergy Center website actually loads faster than Google does! GTmetrix is a popular site that analyses websites and page speed. The image below is a GTmetrix screen capture showing performance scores and page load speed.